snowdeal.org > ex machina: the postcard project: cleveland ohio. the postcard project: cleveland ohio. 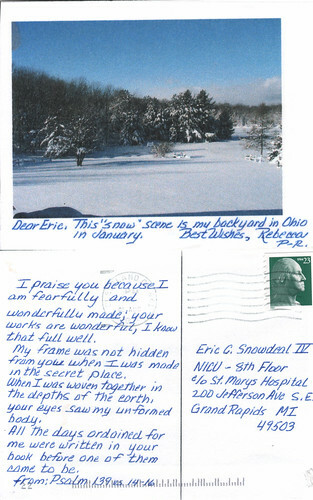 rebecca sent a nice postcard with a psalm and a photo of her backyard in cleveland, ohio. she also sent a postcard from pittsburgh and if i'm not mistaken i have at least one or two more in the stack from her. so when you think that the world is filled with selfishness, just remember that there are people like rebecca who are more than willing to keep strangers smiling with their kindness.